ILYAM | What Does ILYAM Mean? ILYAM means "I Love You As a Mate". The abbreviation ILYAM can be considered a diplomatic way of making it clear that you have no interest in a romantic relationship. It is sometimes used as a response to the abbreviation ILY and other such declarations of love. The use of the word "mate" in the abbreviation ILYAM can cause confusion in the USA and amongst non-native English speakers, as the word is officially defined as "the sexual partner of a bird or other animal". However, outside of the USA and particularly in Britain, Australia and New Zealand, mate is slang for "friend". 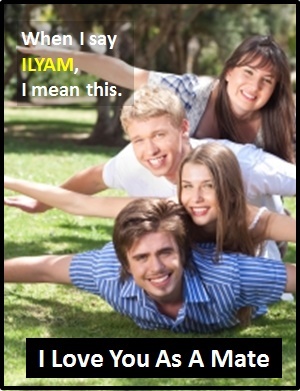 ILYAM is another way of writing the abbreviation ILYAAF (I Love You as a Friend). "I Love You As A Mate"
Chris: You are very special to me. There is no-one else I would rather be with. Celeste: Thanks Chris. You are very special to me too. ILYAM. Wayne: I don't know what I'd do without you. I think I love you. Pam: Thanks Wayne. ILYAM too. ILYAM is an initialism abbreviation. Technically, this means it is pronounced using its individual letters (i.e., Aye Ell Wye Eh Emm), but as this is harder to say than "I Love You As A Mate" it is not often uttered using its letters. In other words, the abbreviation ILYAM is for efficiency in writing and not efficiency in speech. The abbreviation ILYAM is normally used as a standalone declarative sentence (i.e., a statement) with the meaning "I Love You As A Mate". ILYAM is not often used as another part of speech within a wider sentence. Before the digital era, we would have just said "I Love You As A Mate" instead of using the abbreviation ILYAM.